Dr. Pamela McCauley Bush empowers STEM professionals and students to be global innovative leaders. Dr. Bush's positive, evidence-based approach is most inspiring! Heralded as an award-winning educator, innovator and engineering role model, Dr. Pamela McCauley Bush will speak at Stanford University on October 22nd on the topic of “Innovative Leadership,” addressing the needs, challenges and benefits of developing as an innovative leader as well as the option to focus on being a leader in innovation. 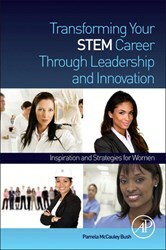 The talk and "Transforming Your STEM Career Through Leadership and Innovation" book signing is sponsored by IEEE-WIE-SCV and SWE; Co-Sponsor: Stanford IEEE & WIE and SWE Student Chapters Registration: http://wie-leadership-scv.eventbrite.com. At the Global Humanitarian Technology Conference in San Jose California, on October 23rd, Dr. Bush will provide an insightful and in-depth discussion of ergonomics, safety and health in occupational and manufacturing environments in developing nations. Dr. Bush will also give a keynote address as well as moderate the panel discussion on "Mobile Devices In Disaster Readiness and Response." The panel will feature panelists from the American Red Cross, Google Crisis Management and the MIT Lincoln Laboratory, among others. On October 25th, Dr. Bush will share practical advice and guidance on navigating the educational landscape inter-twined with her personal stories of overcoming academic and professional adversity and challenges in her keynote address to the Florida League of Middle Schools Region VII Conference. Her keynote, "Why a STEM Education? Making STEM The Career of Choice!" will unravel the myths around who “should and could” be an excellent STEM Professional in light of or “in spite of” current personal or disadvantaged situations. Dr. Pamela McCauley Bush is a nationally recognized speaker, an award-winning full Professor and engineering expert in the Department of Industrial Engineering and Management Systems at the University of Central Florida where she leads the Human Factors in Disaster Management Research Team. If you have any questions about Dr. Bush or this press release, please contact lizalee(at)transformingyourstemcareer(dot)com.